The holidays may be just a couple of weeks away, but investors are understandably lacking holiday cheer. For starters, the prospect of higher interest rates is keeping investors on their toes. And the latest mass shooting event Wednesday afternoon in Southern California palpably added on to that anxiety. But despite all of the black clouds building over the market right now, the big S&P 500 index still remains just 2.7% shy of all-time highs. To put that into some perspective, the stock market is a couple of strong trading sessions away from being higher than ever before in history -- and that fact signals some of the disconnect that's happening between equity values and investor sentiment right now. In fact, some of Wall Street's biggest stocks are actually within grabbing distance of buyable breakouts right now. Today, we'll turn to the charts for a technical look at five of them. Up first on our list of big bullish stocks is $96 billion German software company SAP (SAP - Get Report) . SAP has enjoyed a solid year in 2015, rallying more than 13% year-to-date, but momentum has really picked up just in the last two months now. Shares were actually double-digits in the negative at the beginning of October. But don't worry if you've missed the recent rally in SAP; shares look likely to kick off a second leg higher in December. SAP is currently forming a pretty textbook ascending triangle pattern, a price setup that's formed by horizontal resistance up above shares (at $81 in this case), and uptrending support to the downside. Basically, as SAP pinballs in between those two technically significant price levels, shares have been getting squeezed closer and closer to a breakout above that $81 price ceiling. When that breakout happens, we've got our buy signal. Relative strength, (not to be confused with RSI at the top of the chart) adds some extra confidence to the upside in SAP right now. That's because this stock's relative strength line is holding a new uptrend line from the middle of October, indicating that shares are back to beating the broad market averages. Keep a close eye on SAP here – this is a relatively short-term trading setup, and it's close to breaking out this week. We're seeing a similar setup in shares of Berkshire Hathaway (BRK.B - Get Report) , albeit with a bit of a twist. Berkshire has been correcting for much of 2015, and the ascending triangle pattern in this stock is showing up at the bottom of its recent range, rather than the top. Even though that means that Berkshire's price pattern isn't exactly textbook, it's still tradable. 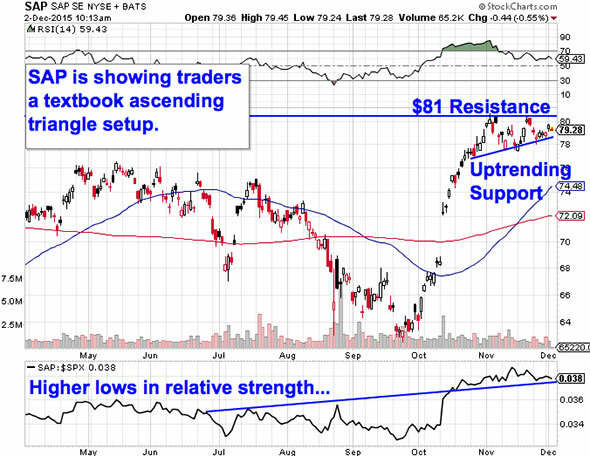 The buy signal comes on a push above the top of this stock's resistance range. For B-shares, that's up at $139. Why all of that significance at the $139 level? It all comes down to buyers and sellers. Price patterns, like this ascending triangle setup in Berkshire Hathaway, are a good quick way to identify what's going on in the price action, but they're not the actual reason a stock is tradable. Instead, the "why" comes down to basic supply and demand for Berkshire's actual shares. The $139 resistance level is a price where there has been an excess of supply of shares; in other words, it's a spot where sellers have previously been more eager to step in and take gains than buyers have been to buy. That's what makes a breakout above $139 so significant -- the move means that buyers are finally strong enough to absorb all of the excess supply above that price level. It's important to be reactionary here and wait for the $139 breakout; Berkshire doesn't become a high-probability buy until shares can catch a bid above that level. $53 billion Spanish banking stock Banco Bilbao Vizcaya Argentaria (BBVA is another big financial that looks ready to show long-suffering shareholders higher ground. BBVA is down more than 14% this year, shoved lower by major economic pressures on the Eurozone. 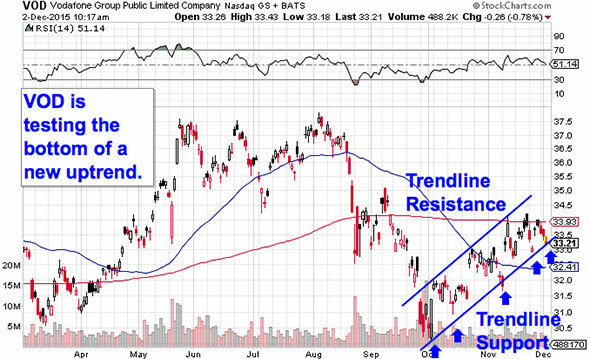 But a classic reversal pattern could spell a breakout, provided shares can clear resistance up at $9.20. 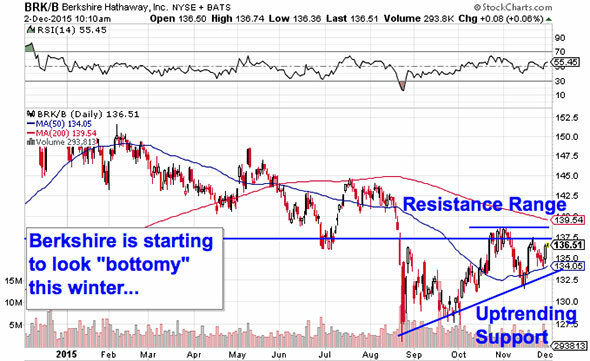 BBVA is currently forming a double bottom pattern, a bullish reversal setup that looks just like it sounds. The double bottom is formed by a pair of swing lows that bottom out at approximately the same price level -- the buy signal comes on a breakout through the peak that separates those two troughs. 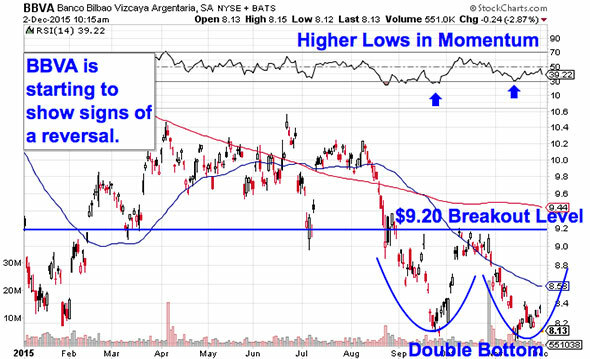 For BBVA, that breakout level to watch is resistance up at $9.20. Momentum, measured by 14-day RSI, adds some extra confirmation to upside in BBVA right now. Our momentum gauge made slightly higher lows on each of the price bottoms on BBVA's chart, creating a bullish divergence. Shares still have some room to retrace before getting back up to $9.20, but it's worth keeping an eye on this winter, especially if a surprise central bank move spurs a rally in European financials. Staying on the other side of the pond brings us to $89 billion U.K.-based cellular carrier Vodafone (VOD . The good news is that you don't need to be an expert technical trader to figure out what's been going on in shares of Vodafone. Instead, the price action in this big cellular stock is about as simple as it gets. Here's how to trade it. Since October, Vodafone has been making its way higher in a well-defined uptrending channel. The uptrend in Vodafone is formed by a pair of parallel trendlines that mark the high probability range for shares to stay stuck within -- every test of the bottom of that price channel has provided traders with a low-risk, high-reward buying opportunity. The channel in this stock may be tight, but it still makes sense to buy the next bounce off of that lower trend line. Actually waiting for that bounce is important for two key reasons: It's the spot where shares have the most room to move up before they hit resistance, and it's the spot where the risk is the least (because shares have the least room to move lower before the channel breaks, and you know you're wrong). Remember, all trend lines do eventually break, but by actually waiting for a bounce to happen first, you're ensuring Vodafone can actually still catch a bid along that line before you put your money on shares. Finally, we're looking at a chart of Wall Street financial giant Morgan Stanley (MS - Get Report) . Like several of the other large-cap stocks we've looked at today, Morgan Stanley is a reversal trade. The key level to watch this December is a breakout through Morgan Stanley's $36 price tag. 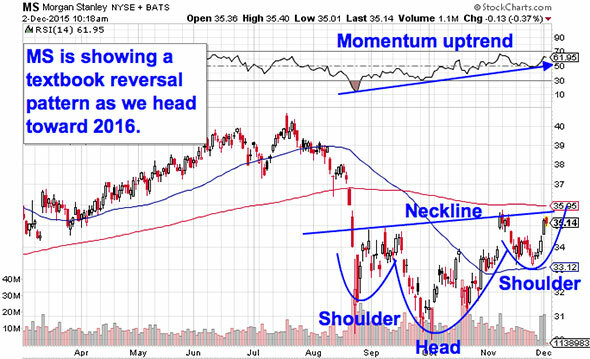 Morgan Stanley is currently forming an inverse head and shoulders pattern, a classic reversal setup that signals exhaustion among sellers. You can spot the inverse head and shoulders by looking for two swing lows that bottom out around the same level (the shoulders), separated by a bigger trough called the head; the buy signal came on the breakout above the pattern's "neckline." That's our aforementioned $36 level in Morgan Stanley. Morgan Staley is another stock where momentum is signaling upside. 14-day RSI has made higher lows on each of the swing lows in this price pattern -- that's an indication that buying pressure has been quietly building beneath the surface in this stock. Like any technical trade, risk management is key if you're thinking about buying shares of Morgan Stanley on the breakout. The 50-day moving average has started acting like a good proxy for support, and that makes it a logical place to park a protective stop. This article is commentary by an independent contributor. At the time of publication, the author was long BRK.B.